Data-Crédito has one of the most advanced operations technologies in its branch of business. The operational controls and procedures guarantee that it functions with the highest levels of security in the handling and processing of information. The "hardware" and "software" systems are designed to be sturdy, flexible, and expandable. 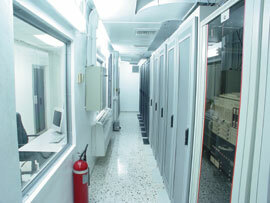 Data-Crédito'sData Processing Center, one of the most complete in Latin America, has a global capacity of One Billion MIPS (Millions of Instructions per Second), which allows it a speed for processing and publication of information well above the technological standards of the marketplace. Redundancy of equipment, systems, and procedures allow us to offer our Affiliates uninterrupted service 24 hours a day, 7 days a week, 365 days a year. The Data-Crédito 2019 system is capable of producing 120 reports per second, equivalent to 7,200 reports per minute. This processing speed allows an authorized user to obtain a report in less than one second; naturally, the calculation of this speed does not include times for data entry or transmission of reports. This processing capacity can satisfy the most demanding Affiliate in terms of volume of reports.